There are moments in every woman's life where a good can of chicken noodle soup is downright necessary. As a gluten-free family, we long ago bid goodbye to this modern convenience. I like to make chicken noodle soup from scratch. It's better that way. But there are times when this mama needs it to come from a can. Take this week for instance. It's the middle of the summer. A massive head cold hits. It lasts longer than any stay-at-home-mom can reasonably afford. I need comfort in a can and I need it quick. 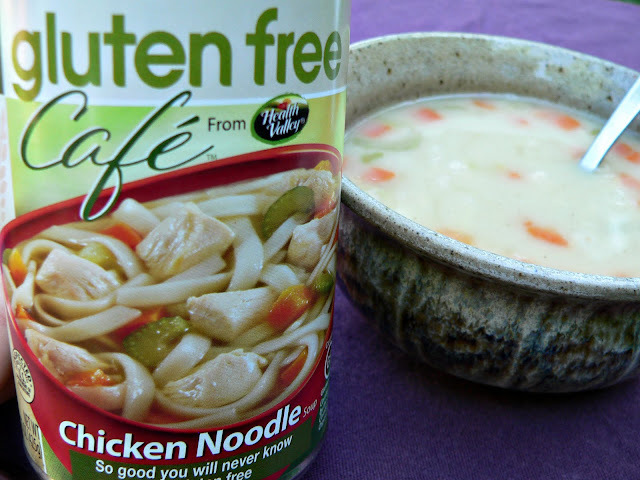 Campbell's chicken noodle soup has always been one of my favorite go-to comfort foods when I'm under the weather. Comfort foods are crucial to my healing. Canned comfort foods are crucial to my mental well-being. It has been years since I've indulged in this canned comfort food tradition with chicken noodle soup. Until this week, that is. I was so pleased to find Health Valley's Gluten Free Cafe line on the shelves at my supermarket. And to think, they offer a gluten and dairy free chicken noodle soup! I was thrilled. Well, as thrilled as a woman with a head full of soreness and congestion can possibly be. And it was good! Very good! 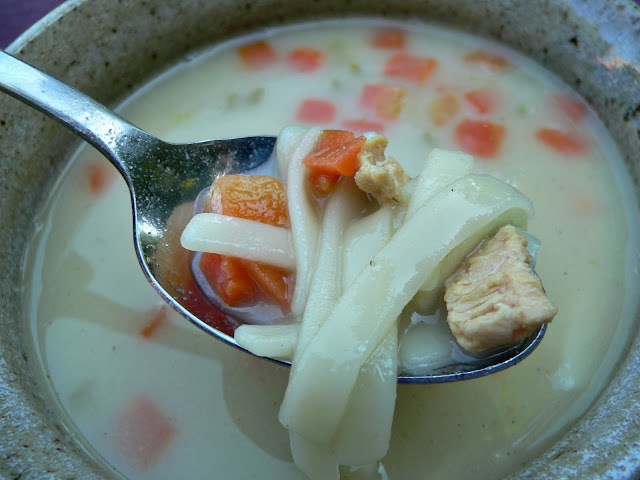 Hearty thick noodles, wholesome bites of chicken, and perfectly mushable carrots and celery. I was pleased. Very pleased. Thank you Health Valley for thinking of us gluten free mamas who need our canned comfort foods every once in a while! This is not a paid advertisement. I like soup from a can every now and again. Who can blame me? Please note that companies can change their ingredients at will. If working with a severe food allergy always double check the ingredient list before consuming this product.